Why Use Liquid Applied Waterproofing Membranes? Liquid Applied Membranes have the unique properties of extreme flexibility combined with seamless and robust bonding – all ideal qualities for a long life waterproofing membrane. Liquid Membranes have a high viscosity formulation designed for application on both vertical and horizontal substrates. 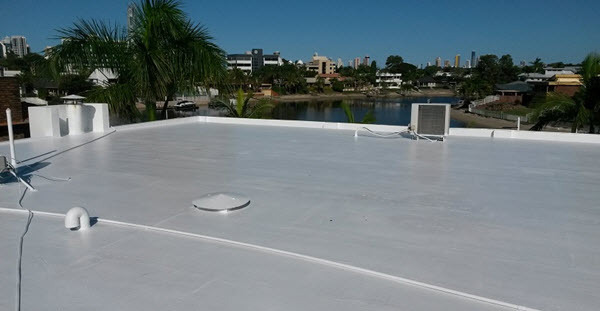 The preferred waterproofing product for the roof project below is a Liquid Applied Membrane System combined with Thermo White Roof Coating. Seamless – so no joins or seams as areas of potential weakness. Flexible – membrane contracts & expands with roof surface. Conforms to Shape – around roof services, rails, stairs etc. OH&S Compliant & Eco-Friendly – no heat, fumes or torches. High Performance - Long Live & Robust Adherence. Encapsulation – preserving whatever is underneath & protection from weathering. Cost Effectiveness – liquid roofing provides a cost-effective method of making a new or existing roof waterproof. Liquid Coating Systems will bond to a great many substrates, allowing its use in many situations without having to remove and dispose of the existing surface. This saves time and avoids the cost of removal and cost/environmental issues associated with disposal. Remedial Waterproofing present many challenges and Liquid Membranes are suitable for many repair projects. Liquid System makes it easy to seal and make water tight around all existing fixed structures and utilities. 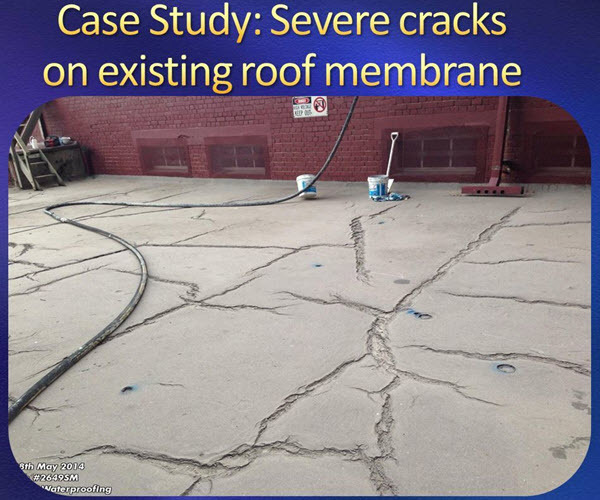 Video below outlines waterproofing repairs to an industrial roof & plant deck area. The severely deteriorated existing roof membrane was leaking into rooms below. It was not a viable option to remove the original roof membrane so spray-apply liquid membrane was the ideal repair product. 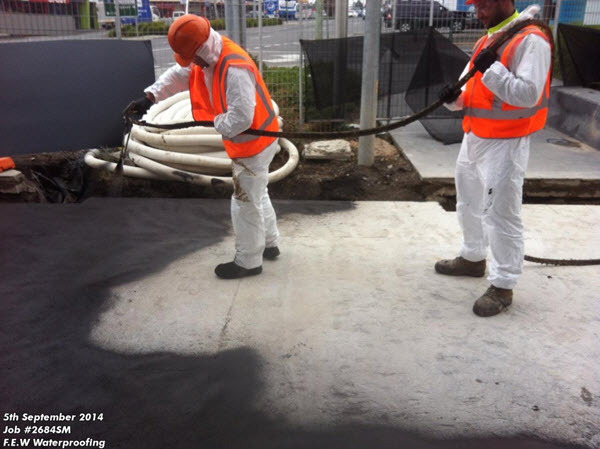 The new waterproof membrane, Liquid Rubber, was spray installed over the existing surface in a matter of days. 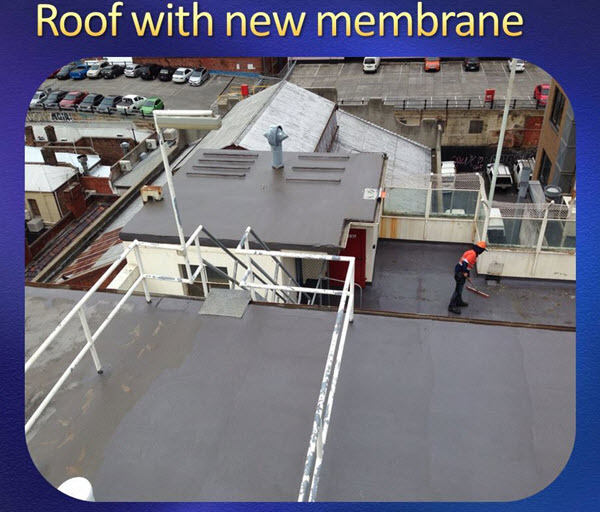 Liquid Membranes offer a long term solution for exiting roofs & can often be applied directly over existing & damaged surfaces - saving time & money. The rooftop project in images below had existing roof membrane that was severely damaged and causing extensive water damage to structures below. Existing roofs often have difficult access so removal and replacement can be prohibitively expensive. The existing leaking roof membrane was prepared and then over-sprayed with a Liquid Rubber Waterproofing System. 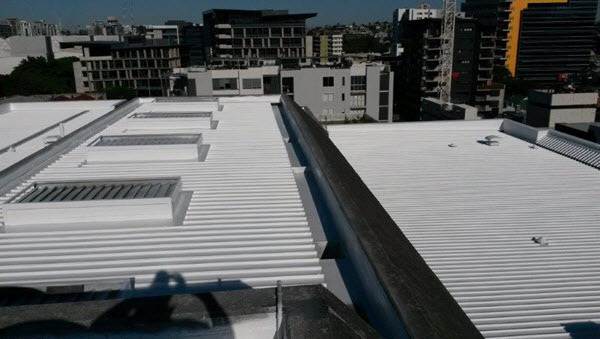 This spray applied waterproofing method provided a seamless, monolithic membrane that coated around all upturns, stairs and rooftop deck and plant equipment. This roof repair project was completed with white Thermal Reflective Top Coat over the base coat of Liquid Rubber. Heat Reflective Coatings provide a robust and flexible roof memembrane that also reduces interior temperature up to approx 8 degrees. 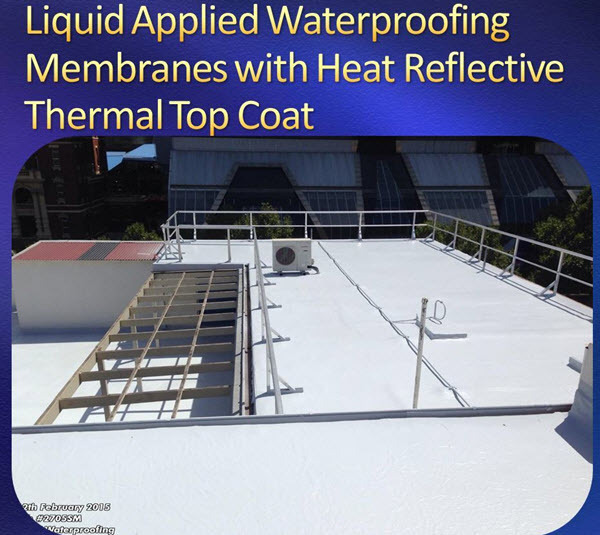 As a cool roof coating, heat reflective products are an excellent top coat to spray over the base coat membrane - this 2-stage system provides a protective long life solution for roof leaks . Thermo Top Coat is not just a roof paint but a waterproof membrane in its own right. Very often when choosing to use Spray-Applied Waterproofing Membranes, there is no need to remove the existing roof surface. Spray application is extremely fast - saving costs and time involved with a complete roof replacement. In fact with Roof Case Study above removing and replacing the damaged membrane was not an option. The roof structure was part of a power station and consequently it was not feasible for the roof to be removed. Added to this was the challenge of providing waterproof repairs in a timely manner. So speed was an essential element for choosing rapid sray applied Liquid Membranes. Added to this ware the challenges of bridging the transition between the new membrane and existing roof. Spray application for the waterproofing membrane was the perfect solution. Spray applied membranes are ideal repair solution for all types of roof surfaces. There is no need to go through the expense and inconvenience of roof removal & replacement – we over spray over your existing deteriorated roof membrane. One component system.Safe to use. Self cross linking polymer for durability. Highly flexible (accommodates movement and minor cracking insubstrate). UV stable – designed for long term outdoor exposure. Includes strong algaecides to reduce algal and mould growth. Water based for easy application and cleanup. Suitable for application on horizontal or vertical surfaces. Bright white colour to reflect solar rays and reduce thermal heat transmission. Permanently flexible, excellent resistance to embrittlement. Excellent adhesion over a wide variety of substrates. Can be painted over with any acrylic based paint. Two stage liquid waterproofing system provides a robust and flexible waterproofing membrane together with solar reflective top coating.